Fabric8 presents Flights of Fancy, a juried group exhibition of works by artists Alec Huxley, Andy Stattmiller, David Garvey, Jenn Porreca, Jessica Eastburn, Julie West, Kelly Ording, Lee Harvey Roswell, Micah LeBrun, Rob Reger, and Sarah Coleman. Addressing things that fly or are pie in the sky, Flights of Fancy covers the gamut of luscious imagery, from beautifully rendered birds to highly textured imaginations. Artists were at liberty to interpret the theme and did so splendidly. The jury included the principals and staff of fabric8 along with artists Erik Otto, Reuben Rude, Ursula X Young, and NoMe Edonna. 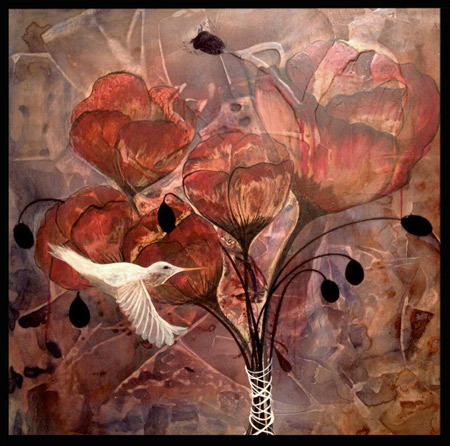 Flights of Fancy was on exhibit from August 25 through September 24, 2012.